Draw contours on an unstructured triangular grid. tricontour and tricontourf draw contour lines and filled contours, respectively. Except as noted, function signatures and return values are the same for both versions. in which case a Triangulation object will be created. See that class' docstring for an explanation of these cases. 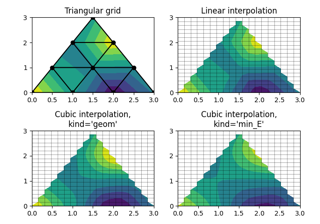 where Z is the array of values to contour, one per point in the triangulation. The level values are chosen automatically. contour up to N+1 automatically chosen contour levels (N intervals). draw contour lines at the values specified in sequence V, which must be in increasing order. fill the (len(V)-1) regions between the values in V, which must be in increasing order. Use keyword args to control colors, linewidth, origin, cmap ... see below for more details. tricontour(...) returns a TriContourSet object. colors: [ None | string | (mpl_colors) ] If None, the colormap specified by cmap will be used. If a string, like 'r' or 'red', all levels will be plotted in this color. If a tuple of matplotlib color args (string, float, rgb, etc), different levels will be plotted in different colors in the order specified. cmap: [ None | Colormap ] A cm Colormap instance or None. If cmap is None and colors is None, a default Colormap is used. norm: [ None | Normalize ] A matplotlib.colors.Normalize instance for scaling data values to colors. If norm is None and colors is None, the default linear scaling is used. origin: [ None | 'upper' | 'lower' | 'image' ] If None, the first value of Z will correspond to the lower left corner, location (0,0). If 'image', the rc value for image.origin will be used. This keyword is not active if X and Y are specified in the call to contour. 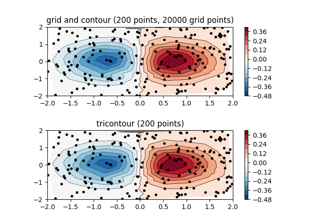 If origin is not None, then extent is interpreted as in matplotlib.pyplot.imshow(): it gives the outer pixel boundaries. In this case, the position of Z[0,0] is the center of the pixel, not a corner. If origin is None, then (x0, y0) is the position of Z[0,0], and (x1, y1) is the position of Z[-1,-1]. locator: [ None | ticker.Locator subclass ] If locator is None, the default MaxNLocator is used. The locator is used to determine the contour levels if they are not given explicitly via the V argument. extend: [ 'neither' | 'both' | 'min' | 'max' ] Unless this is 'neither', contour levels are automatically added to one or both ends of the range so that all data are included. These added ranges are then mapped to the special colormap values which default to the ends of the colormap range, but can be set via matplotlib.colors.Colormap.set_under() and matplotlib.colors.Colormap.set_over() methods. xunits, yunits: [ None | registered units ] Override axis units by specifying an instance of a matplotlib.units.ConversionInterface. linewidths: [ None | number | tuple of numbers ] If linewidths is None, defaults to rc:lines.linewidth. linestyles: [ None | 'solid' | 'dashed' | 'dashdot' | 'dotted' ] If linestyles is None, the 'solid' is used. If contour is using a monochrome colormap and the contour level is less than 0, then the linestyle specified in rcParams["contour.negative_linestyle"] will be used. Last updated on Apr 18, 2019. Created using Sphinx 1.8.5. Doc version v3.0.2-2266-ga3e2897bf.